"JUNE'S FORMULA FOR 50+ YEARS OF MARRIAGE"
When Grandma June and I were married over 65 years ago, I am sure that neither of us really imagined what a grand life we would have together. We were both only 24 years of age. (Close to your age.) I had just been discharged from the U. S. Army's Counter Intelligence Corps. where I had served for four years. We had our first date on a warm evening in the spring of 1951 at “The Spot” on Chetek Lake Narrows. I was home on leave from the Army at the time. Grandpa Tom made the introductions. I am sure that he had no idea what a great gift he presented me with at that moment. Grandma June was a once in a lifetime find. I had been searching for a rose and Grandpa Tom gave me an Orchid. Perhaps it was a “Divine Appointment” and we did not know it at the time. 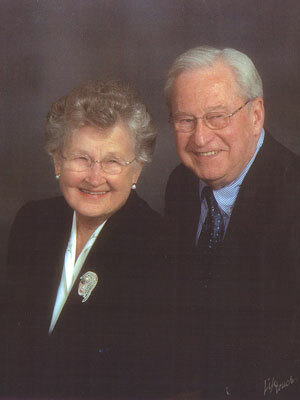 It was just a Little over a year later that we were married on August 16th 1952. This was a few months after starting my first career job with State Farm Insurance Companies. (Later I had a second career as a forensic consultant.) Our marriage was at Bloomington, IL where I was just finishing attendance at State Farm's Claim School. The Tennessee Waltz was a song popular at that time. It became our song. Whenever I now hear the Tennessee Waltz played, It brings back sweet memories of a special time and a special place. Our first marriage home was in Chisholm, then in Duluth and finally in Fridley. Because of my forensic activities we were able to travel all over the United States, Canada and many times to Europe. Our favorite City became London where we established a friendship with an English couple and literally watched their two children grow up over the years and over a period of 9 visits to their home. Grandma June loved to dance. We were able to waltz the night away in such exotic and far away places as Moscow and Leningrad. We had a lifetime of adventure. Grandma June and I would hope that your lifetime together is also one of adventure and without regrets. I would doubt that I could ever have visualized or imagined the impact that Grandma June would have on my life from that day in 1952. I would never have guessed that Grandma June would so capture my heart that no matter where I am at, she is the first thing on my mind every morning and the last thing every night. She is both the love and the light of my life. Our house is no longer a home now that Grandma June is living in her Heavenly mansion. A House is just a house without the heart in it. Although Grandma June is gone in body I find her spirit everywhere about the house. I find Grandma June's invisible presence in every room I enter and in every closet and drawer I open through a hundred poignant little reminders. Overlook each others Faults: I would hope that whatever faults you each have, and bring with you into your marriage, that the other would by this time be aware of them and be ready to overlook them. For me it was easy. I honestly cannot recall any faults that Grandma June may have had but unfortunately I had and have a number of faults. Grandma June chose to overlook my faults and loved me all the same. I have heard that there are angels among us. At one time I suspected that Grandma June was an Angel but I am sure that angels would not marry mortals or be struck down by Alzheimer's. Disagreements: Every couple will at some time have some disagreements. If you were to ask Grandma June if we had such disagreements she would always tell you, "No, we did not." I have heard her answer that question many times over the years and she has always said "No" to whoever posed the question. She has said to me many times – “We really get along good don't we Stan?” While there have been very few such disagreements over the years, unfortunately there have been some. I know that they have always been my fault. While I know that truly in Grandma's mind there were none, I am sure that like God, Grandma June just forgave me and thereafter blotted them from her mind and wiped my slate clean. Speaking from my own experience, most such situations result from little things that have no real importance or meaning but are the result or foolish pride, selfishness and stubbornness. I would define “Foolish Pride” as that inner voice that tells us how wonderful we are and woe unto them who would dare to mess up that image. I recall one time many years ago when I was upset over something that was of such little real importance that a short time later I could not even remember what it was. But I did remember that my childish attitude was very hurtful to Grandma June. I remember her sitting down by me, placing her hand on my arm and looking into my face with such sad eyes. It is just one of the snapshots of my life that makes up my personal memory bank. It is said that the Holy Spirit resides in our bodies. Perhaps our conscience is the Holy Spirit at work and that such snapshots of memory come back to remind us to never do it again. I have many times wished that I could go back and relive those days in my history, do it over and do it right. Unfortunately of course as we all know, such things are just not possible. Making Memories: Our life's memory bank is not a movie or a video. Our life's memories are all made up of a collection of thousands of snapshots made throughout our lifetime. Some of them are happy ones, some are sad ones, some are ones we are proud of and some are ones we are ashamed of. Many of them we treasure and enjoy reliving. I am sure that Grandma June would join with me in wishing that all of your marriage memory snapshots will be happy ones that you will always treasure. Express your Love frequently: I am sure that you both know by this time whether you really are in love. I hope that you will each tell the other that you love him or her on a frequent basis. This is something Grandma June and I did many times over the years. During Grandma June's travel through the darkness of Alzheimer's, I did it many times daily but I really do not know if Grandma June any longer understood me. Perhaps God places such messages forever on and in her heart. "I will love you until China Meets Africa. I will love you until the Salmon sing in the Streets. I will love you until the Oceans are folded and hung up to dry. I will love you until the Seven Stars go Squawking like Geese about the sky. I will love you until the sands of time have ceased their endless trickle"
Grandma June would laugh and ask me to write it down which of course I would do. 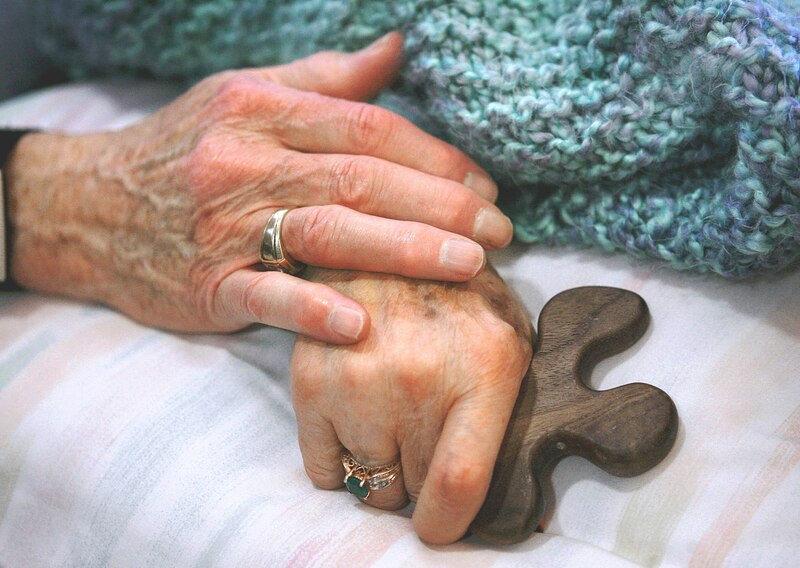 Later as Grandma June slipped more deeply into Alzheimer's, it always seemed new to her each time I repeated it. When Grandma June was deep in the shadows of Alzheimer's, I no longer knew if she understood me when I would tell her I loved her or how much I loved her. Continuously Reaffirm your Loved One's Importance: In addition, I would also hope that you will frequently tell each other just how important the other one is in your life. I always wonder now how often it was that I really told Grandma June how important she was in my life. Of course late in her Alzheimer's, I would tell her daily, but now I regret that I really don't know if I told her often enough in our younger years. You two now have the opportunity to avoid that question or mistake. both died as victims of Alzheimer's - this website is dedicated in honor of both. The CDC (Center for Disease Control) also publishes marriage and divorce statistics. Their 2014 report covers the year 2011 and is based on 44 reporting states and the DC…and the National Survey of Family Growth. No. of marriages in the US are 2,118,000. Marriage rate is 6.8 per 1000 population. Divorce rate is 3.6 per 1000 population. This results in a 53% Divorce rate for the US. Length of marriage...According to the OECD (Organization for Economic Cooperation and Development), consisting of 30 countries, the US is one of the very worst in the world for the low average length of a marriage…The US average is 8 years, while the OECD average is 13.6 years. Italy is the best at approx. 17 years followed closely by Spain. The UK is approx. 11.5. Photo Notes: - Top photo: This is June and Stan's wedding picture of August 1952. This was in the days before Alzheimer's became a part of our vocabulary. The second down photo was taken in December 2003. June was at that time late in the 7th year of her Alzheimer's and the disease was starting to close in on us. In addition to the short term memory loss, we started noting some long term memory loss as well as personality changes. The third photo down was taken at June and Stan's 50th wedding anniversary celebration (August 2002) at our daughter Julie's home. 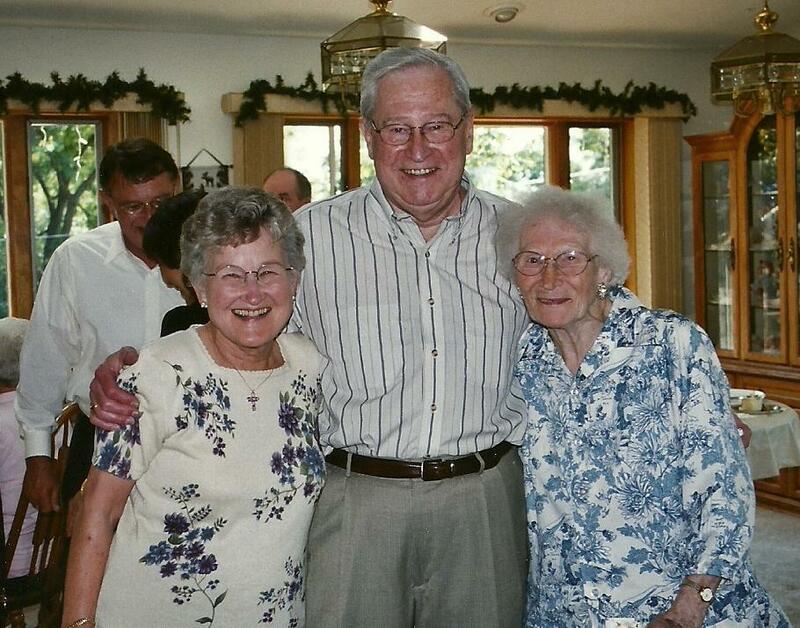 June on the left, Stan and then mother Ellen. 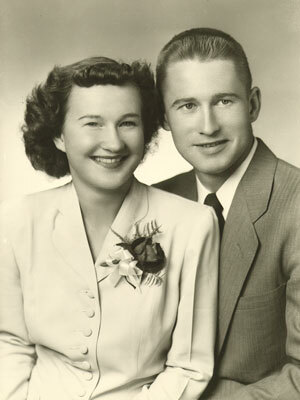 Photo below - "June and Stan during the last two years of June's life." 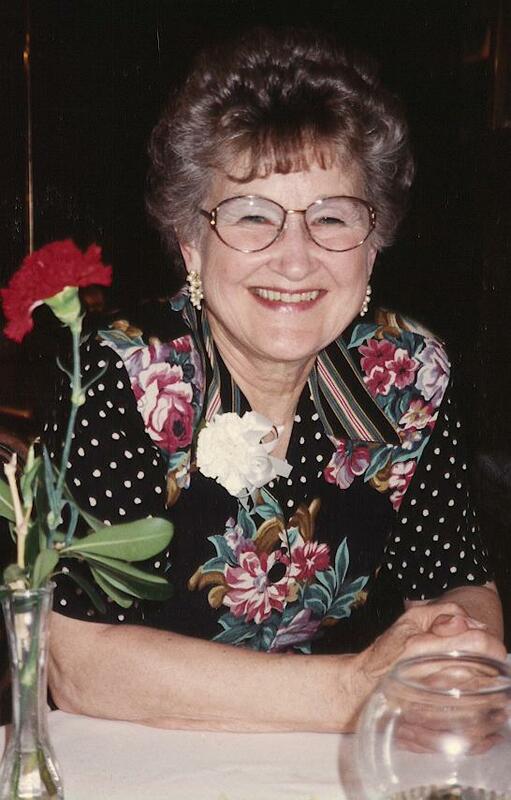 (2007-2008) June was deep in the shadows of Alzheimer's. June did not know me or anyone, did not talk and rarely opened her eyes or ever responded to voice. Our only means of communication was to hold hands. This little wooden cross was June's in the year's 2007-2008. The little wooden cross was hand made and was obtained for June by Chaplain Fran O'Connor. (Fran is the Chaplain at the Benedictine "Holy Spirit" Chapel.) June held the cross tightly through out the day as she would all or any objects placed in her hand, giving it up only when put to bed for the night. It was a replacement for the gold necklace and cross (stolen) that June had worn for most of her life. June was always proud of being a Christian. Although God certainly knew who she was, she no longer remembered God. I know that she would have been proud to know that she was holding God's cross. The little wooden cross remains with June at Lakewood. The stolen necklace and gold cross has been replaced with another that was also a favorite and that too remains with June. The emerald ring on her finger in the photo is also with June as is a Seiko ladies watch that I bought for June for her birthday in 2001 while we were at an IABPA Conference in Tucson, AZ in October. June has/wears my diamond man's ring on one of her fingers and I wear her marriage engagement ring as a necklace. I have instructed my children that when I pass on, the marriage ring that June gave to me is not to be removed from my left hand ring finger. It has not been removed since we were married in 1952 and it is my desire that it never be removed. Stan's Comments: While I authored this page, I claim none of the wisdom found on the page. I am only the person who was blessed to be June's husband and the guy who was lucky enough to be able to go along for the ride. It is also my way of saying "thank you" to June who had the heavy oar in our marriage. While I make reference to a quote from our pastor, all of the other comments and the wisdom found on this page came from June or was inspired by June. June on the other hand, a very humble person, would be the first to give all the credit to Jesus and God our heavenly father. I can do little more than agree with much of her assessment. For those readers who are not a part of our family, there is no intention here to suggest that our marriage is superior to anyone else's marriage or that June and I know it all...this page is simply an historical record of a marriage that has stood the test of time (56 years +) and an enumeration of some of the fundamentals of that marriage that were responsible for it's success. Over the years, this letter has been given to 6 grandchildren, 1 nephew and 3 family friends (and their marriage partners) on the eve of their marriage. The first to receive this letter was a Grandson in 2005. At that time, June was deep into the shadows of Alzheimer's (9th year) and had been placed in the care of an Alzheimer's facility. This or these letter's reflecting June's love and wisdom were my efforts to allow June to live on in the lives and memories of our family and friends. June was truly an extraordinary person and a person of the likes of which I do not expect to again meet in my lifetime! ...Stan Berg. "June and Stan - Divine Appointment or Chance Encounter?" Dianne Cogar – Springfield,Ohio - (13 June 2012): “What a warm and touching letter. Your friends and family are very fortunate that you and June pioneer the way for others in understanding the essential things required for having a loving and lasting marriage….Your story is a legacy in itself. We can only hope that those you have given this wonderful letter to down through the years will share it with conviction, helping others to understand that it actually takes labors of love, understanding, faith, and respect to have a lasting relationship with a marital partner…a divine gift we are given…Marriage requires a disciplined attitude, respect, a longing, and a need...each partner must have a warm heart to keep the flame burning"....(27 August 2012): What a beautiful heartfelt letter, your family is very lucky that you...share June's formula for a successful marriage. Her legacy is, indeed, a charted path for these children to learn from...it will still require much work for your children's own destiny, as a couple, to follow the footsteps of you and your beloved June, hopefully they will discover...if they were just as blessed as well by the grace of God to have conformable chemistry and mutual respect in their marital union...important aspects of a truly "successful marriage." Anthea Young - East London, Eastern Cape, United Kingdom - (26 August 2012): "Thank you for sharing your love stories & formula for a successful marriage with us... I aspire to have a love like yours one day!" Lynette Richards - Hindhead, United Kingdom - (27 August 2012): "A beautiful account of a blessed marriage." Debra Brown Leen - Bangor, Maine - (27 August 2012): "Wonderful!!!" Louise Ann Howard - Batemans Bay, New South Wales, Australia - (23 August 2014): "Wow Stan, wish many parents would give such a letter to their children family etc. it is so so beautifully fitting. It should be written in gold on the most beautiful paper wrapped in a silk ribbon. Thank you my friend both of you." Wanda Montgomery - Woodstock, Georgia - (23 August 2014): "Thank you Stan and Thank you June...This should be given to young adults to read before they start dating. I actually believe there should be a class in high school about relationships Love and marriage and it's meaning. This should be the first thing read..JUST BEAUTIFUL! PERFECTLY!! Pixi St. Clair - Tarnagulla, Victoria, Australia - (24 August 2014): "TY Stan. Needed to hear this today." Lisa Tallakson Horgeshimer - Minneapolis, Minnesota - (24 August 2014): "Beautiful Stan!" Kathleen Dean - Fredericktown, Ohio - (24 August 2014): "Precious." Sue Strayer Orcutt - Maple Grove, Minnesota - (24 August 2014): "So Beautiful!!!!!" Christy Bumpous - Pleasant Plains, Arkansas - (24 August 2014): "Wise words from experts...60 years of love!" Deborah Anne Shepard - Pacific Grove, California - (24 August 2014): "Your heart, your life you shared to show it is beautiful, the angel in her stays with you, you show the memories can help to until both spirits meet...truly beautiful love story i have read the entire page... all the beautiful parts of your life... you are a inspiration...thank you for your beautiful words...love to the soul which passes to the other to slumber, be safe share in the nights , one will encompass as the each butterfly will meet one day, one carrying the others wing till then each is together with memories path , as one will carry as the wing slumbers." Louise Ann Howard - Batemans Bay, New South Wales, Australia - (9 September 2014): "Marriage is for life. I live under the same roof rules. In Gods eyes we are married in the eyes of law we are separated thus we have been 23 years." Lisa Everson - Rockville, Indiana - (29 June 2016): "Very touching Stan! I enjoy your insight into so many life experiences and I am very grateful you choose to share them for others!" Marsha McKneely Ault - Nacogdoches, Texas - (29 June 2016): "Your and June's love transcends this earth life. Thank you for your example of forever love." Deborah Gusman- Melbourne, Australia - (18 December 2016): "A beautiful formula to live by Stanton, doesn't seem too hard does it! It saddens me greatly how little marriage is taken seriously these days and how easily it is thrown away. I believe it does take care and devotion and forgiveness to achieve a success. I am still working on mine but have so far travelled 35 years with many ups and downs, illnesses and what have sometimes seemed like un-fixable issues but we are still together supporting each other and understanding each other better than ever before. Your life with June certainly was special and it shows in your devotion to her memory."